If you want to take a peek at how AOL plans to take on Facebook, you need to look beyond Bebo (the social network it bought for $850 million last year) to theBoot, a country music site hidden away off in a corner of AOL Music. A very interesting experiment is going on at theBoot that represents a major plank in AOL’s social-networking strategy. It shows how AOL plans to take on Facebook Connect, which is Facebook’s way of letting other Websites tap into its members and their activity streams. AOL is adding its own twist to spreading activity streams across the Web through a combination of its SocialThing lifestreaming service (which it bought last year and was recently rolled out inside of Bebo) and AIM chat. It is called Socialthing for Websites. When you visit theBoot, you will see a thin toolbar along the bottom that is labeled Socialthing on the bottom left (think of it as FriendFeed) and on the bottom right it invites you to sign in using an AIM account. (Yes, that is yet another frame). Once you sign in, your AIM username and password becomes your username and password for the site, just like Facebook Connect extends Facebook IDs to other sites. OAuth and OpenID options are planned for the near future. Next to the Socialthing icon on the toolbar is a prominent gear icon for privacy settings and an “Updates” tab. You can choose to always share your activity on the site, never share it, or always be asked before sharing. When you click on Updates, a window pops up showing you “Site Updates” and “Buddy Updates.” The site updates is a stream of new stories and comments going on right now at theBoot. You can tab over to “Buddy updates” to see status messages from people on your buddy list, as well as actions of your friends from other services including Twitter, Flickr, YouTube, and StumbleUpon.. Whenever you comment on a story or take another action on the site itself, that comment appears not only in the site updates stream, but all of your buddies on AIM will see a little info icon next to your name, which if they click on will show your recent comment with a link back to the site. In other words, AOL is taking the 45 million active users of AIM and finally turning them into the underpinnings of a social network. Once you sign in with your AIM account, a couple chat tabs appear on the bottom right. You can chat with other AIM members on the site or you can have a private chat with people you know on your buddy list. (You can also invite your friends to the site that way). Part of Facebook Connect, I should note, also includes Facebook Chat, so there is overlap here. But AOL still has the advantage when it comes to chat. The whole project is not what you’d expect to see from AOL. Maybe that is because the product is being led by Alex Bard, the founder and former CEO of Goowy, another startup AOL picked up as a small acquisition last year. It took a while, but some of that startup DNA is finally starting to rub off on the rest of AOL. What AOL is trying to do is combine public and private message streams. 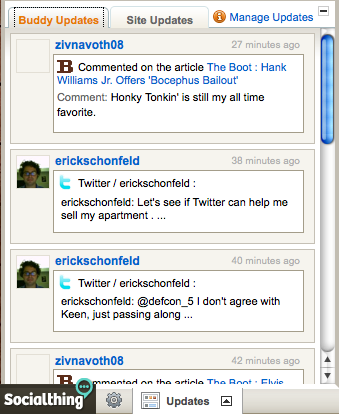 You can see public streams on the Socialthing side of the toolbar and both public and private chat on the right. You can expect to see AOL roll out Socialthing for Websites across all of AOL Music, Moviefone and potentially all of the properties under its MediaGlow umbrella, which has a collective audience of 70 million unique visitors in the U.S. After AOL rolls out Socialthing for Websites to its own properties, you can bet that it will offer it to other Websites as well. The appeal would be that this is a way to socialize their sites that isn’t Facebook. It also gives them the ability to inject their content directly into consumer’s activity streams through Socialthing. AOL is offering Socialthing to Websites for free because it could provide really valuable data on who is visiting what sites that could be used to target content and advertising in the future directly into the lifestream. AOL will have to tread carefully there, limiting sponsored updates, but that is an obvious direction. Now all AOL has to do is refresh its AIM client to include the the lifestream from Socialthing so that users can see one unified activity stream of both public and private messages all in one place.